A disciplined, orderly life was second nature to Steven Hall. 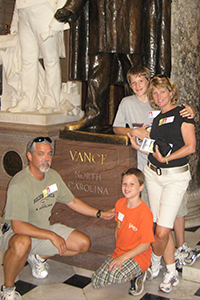 He served in the U.S. Army for 35 years, including two tours to Afghanistan. And when he returned home, he continued protecting his community in North Carolina as a police officer for 30 years. 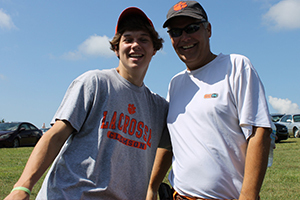 A year after sending his son, Tucker, to college, the life Steven had created descended into unfamiliar territory for him and his family when he was diagnosed with a fast-moving cancer. After more than 25 years as a member of High Point, N.C., Lodge No. 1155, Steven formed lifelong friendships with his Elks family. Even while battling cancer, Steven continued to serve as the Lodge’s Exalted Ruler and was joined by his friend of more than 40 years, Britt Moore, who became the Lodge’s Lecturing Knight. 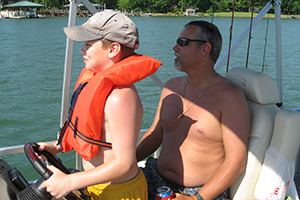 While battling cancer, Steven continued making plans for his family. He asked fellow Elks to make sure Tucker received information about the Elks National Foundation’s Emergency Educational Grant, offered to the children of deceased or totally disabled Elks. Steven’s wish that his family be taken care of was answered. After Steven’s passing, Tucker received the scholarship, continuing his education at East Carolina University where he is pursuing a degree in business, specializing in finance. “As Elks members do, they have looked after our family and delivered on their promise,” says Jenni, Tucker’s mother. Before receiving the scholarship, the stress of paying for college and helping his mother pay their bills weighed heavily on Tucker. His father had always worked hard to make his family comfortable, and Tucker tried to do the same by keeping the illusion that his family’s lives “were not just completely flipped upside down.” The EEG lifted the Halls’ anguish. Like he did in high school, Tucker continues to excel in his studies and is involved with many extracurricular activities, including playing intramural football and disc golf, and coaching intramural softball. He’s working hard to fill the shoes his father left for their family. “In addition to handling his responsibilities at college, Tucker has stepped up to the role of ‘man of the family’ to help take care of his mom after his father passed,” Moore says. By joining the Order, Steven knew his family would never be left behind and Tucker will never be alone because they’ll always have their Elks family. In 2018-19, the Elks National Foundation allocated $323,890 to fund the Emergency Educational Grant program for children of deceased or totally disabled Elks. If you know any Elks children who may be eligible to receive an Emergency Educational Grant, encourage them to visit enf.elks.org/eeg for information, including eligibility and deadlines.